We've talked about elements and what they are made of, namely atoms. The ancient Greeks thought there were just four elements, and that everything else was made of combinations of those. The basic idea was right, they just got the actual elements wrong. We know now that neither air, fire, earth, nor water are elements. 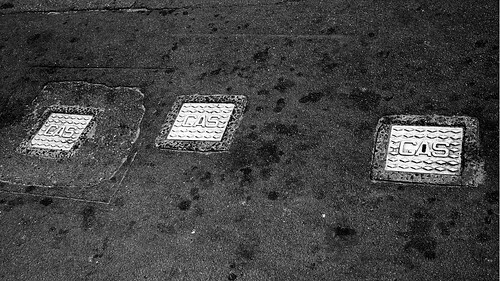 The question then comes to mind: What are they? 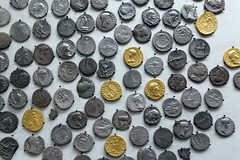 Ancient Roman coins: gold and silver. Putting that aside for a minute, let's consider the true elements, the ones we've since discovered really are the fundamental chemical substances of the universe. They're a mixed bag. They include things like gold, silver, and platinum—noble metals that have the aura of wealth and prestige about them, substances that feel like they deserve the distinction of being important and noteworthy. Then there are things like carbon and sulphur—base materials produced by cooking wood into charcoal or gathered from stinking deposits near geysers and volcanoes, substances that when mixed together with the crystals that form on dung heaps produce black powder, which gave people a much more effective way to kill each other than hitting them over the head with sharp objects. And then there are elements like tantalum and xenon, which most people have never even heard of. There are about a hundred different elements, and they are a very motley assortment indeed. They include hydrogen, an invisible gas that is the lightest substance known, and lead, a metal renowned for its heaviness. They include oxygen, which we need constantly to survive, and arsenic, a long-time poison of choice for murder mystery writers. They include the metals tungsten, which has a melting point so high that it's used as the glowing element in hot incandescent light bulbs, and gallium, which will melt in your hand. But there are many more than a hundred different identifiable substances. You can probably name that many yourself: wood, water, wool, granite, grass, gravel, paint, paper, plastic. So where does this diversity come from? Well, the Greeks basically had it correct there. The elements can combine in various different proportions to make different materials, with different properties. There are a few different ways in which they can do this. You can combine many metals by melting them down, mixing them together, and letting them resolidify. Such mixtures of metals we call alloys. Brass is a common example, and is an alloy of the elemental metals copper and zinc. There are also various alloys of gold and silver used for jewellery, and copper and nickel and other metals used for coins. 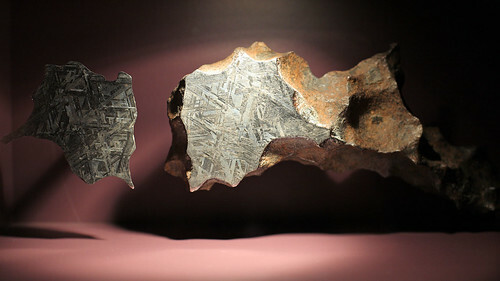 Crystal structures in a metal: The Henbury Meteorite. In a molten alloy, the atoms of the elemental metals basically just mix together in a hodgepodge agglomeration, like if you mixed together sand and sugar. You can mix an alloy in virtually any proportion and the atoms just mix up. When the alloy cools down and solidifies, the atoms of the component metals form crystal structures. It doesn't matter too much what the proportions of the metals are, you'll end up with some sort of alloy when it's cooled down. The proportions do make a difference in the properties of the final alloy, particularly things like the hardness and melting point, but the important point here is that you can mix an alloy in pretty much any proportion you like. The atoms don't care. This contrasts with another form of mixing atoms together. I've mentioned in an earlier annotation that burning is a chemical reaction in which a substance combines with oxygen from the atmosphere. Let's burn some carbon. Carbon is an element which is familiar to most people in several forms. Coal and charcoal are both relatively pure forms of carbon, as is the graphite found in pencil leads. And then there is diamond, which is also almost pure carbon. But let's not burn diamonds (yes, diamonds burn, but do not try this at home unless you, almost literally, have money to burn), let's just burn some charcoal. The burning process which we call fire is the rapid combination of atoms of carbon in the charcoal with atoms of oxygen from the air. It releases heat and light because the carbon and oxygen have chemical potential energy stored in them. In a chemical reaction, things generally like to get rid of energy. So if given a good excuse (i.e. being heated up), the carbon and oxygen will reconfigure themselves to a state with less energy, which means releasing it in the process we know as burning. After being burnt, the carbon and oxygen have combined to form a new substance: carbon dioxide. This is a gas which is made up of tiny particles flying around and bouncing off one another - but these particles are not atoms. Each particle is instead a clump of atoms, made of precisely one carbon atom and two oxygen atoms. This clump is extremely stable. It can bounce around, forming a gas with bazillions of other tiny clumps just like it, and not be knocked apart. It also doesn't let anything else stick to it. The clump is what we call a molecule of carbon dioxide. In many respects, a molecule behaves in very similar ways to an atom - the only difference is that it's a small collection of atoms, stuck together in a more or less stable arrangement. The behaviour is especially atom-like when thinking about molecules of gases and liquids, that can slip past one another and cause the gas or liquid to flow and slop around. In fact, most of the elemental gases such as hydrogen, nitrogen, and oxygen don't consist of single atoms bouncing around at all. Each of these gases is made of small particles bouncing around, but each particle is a tightly bound molecule made of exactly two atoms of the element. This is why when you see chemical symbols or equations representing these gases, they are written as H2, N2, and O2 respectively. The H, N, and O are the symbols for hydrogen, nitrogen, and oxygen, and the subscript 2 means there are two atoms of the element in each molecule. The same notation can be used to describe a molecule of carbon dioxide: CO2 - one atom of carbon (C) combined in a molecule with two atoms of oxygen. Molecules are important to know about because in many of the cases where you're discussing a substance, you want to talk about the tiny particles that make it up, but for most substances those particles are molecules, rather than atoms. Because if you think about the individual atoms, you need to think about atoms of carbon, or of oxygen. You lose the identity of the substance being carbon dioxide. But you can validly talk about the molecules of carbon dioxide, which are the smallest possible pieces of the substance "carbon dioxide" that can exist. They're really kind of like "atoms" of carbon dioxide - just that each "atom" happens to be made up of atoms of other things. Illustration of water, composed of molecules that move around one relative to one another. Image based on Creative Commons Attribution-ShareAlike image by Wikimedia contributor Qwerter. Another very important molecule is water. Water is not an element like the Greeks thought. It is a compound substance made of hydrogen and oxygen. 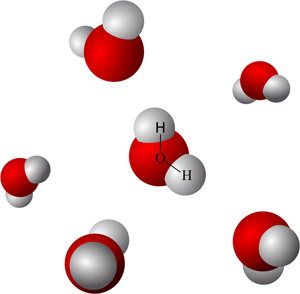 A molecule of water consists of two atoms of hydrogen and one atom of oxygen, giving it the chemical symbol H2O. Water is amazing stuff, and we'll have much more to say about it in the future. Some gases are not made of molecules at all. Argon is a gas that makes up almost 1% of Earth's atmosphere, and it does so as single atoms. Argon atoms don't like to combine with anything, including other argon atoms. So they go around alone, being gaseous all by themselves. Argon is an example of the so-called noble gas elements, which also include helium, neon, krypton, xenon, and radon. None of these gases like forming molecules, although they do so in a few exotic molecules. But for the most part they exist as lone atoms. Then there are gases that are not made of a uniform collection of either atoms or molecules. If you mix nitrogen and oxygen and carbon dioxide and water vapour and argon, for example, the molecules and atoms of these different gases don't react with one another. Rather, they stay separate and simply bounce around off one another in a way that makes the overall mixture look like a uniform gas, even though it's made up of molecules of lots of different gases. In fact, if you get the ratios right, this mixture is basically air. While molecules are important, they are not the only way in which elements can combine in fixed ratios to form other substances. We've already seen that alloys can be made in pretty much any ratio of the constituent metal atoms. But there's another type of non-molecular compound which is very different. If you take the dangerously explosive metal sodium and the poisonous, corrosive gas chlorine and react them together, you find that they combine to form a compound that is strictly equal numbers of sodium and chlorine atoms, leaving any extras of one component behind. But the atoms don't form individual molecules of the compound known as sodium chloride. This compound is not a gas, but a solid, and its structure is crystalline, with the atoms evenly distributed throughout in strict alternation, so the one-to-one correspondence of atoms is maintained, even though the structure is solid and rigid in all directions. You probably have some of these crystals in your kitchen... in the salt shaker. Sodium chloride is common table salt. Many substances are formed of combinations of atoms like this, into solid structures in which the atoms alternate regularly. We call these structures crystals. Many of the things you're familiar with are made of crystals, including almost all types of rocks. The crystals in rocks can be large and visible, like in granite or sandstone, or too small to see easily, like in basalt or shale. A man completely surrounded by molecules! There are also other ways in which atoms can combine to make solids, but we can talk about those later. They lead to things like organic compounds that make up much of the bodies of plants and animals, and polymers that make things like oils and plastics. Today is really all about molecules, but I need to mention these other things to cover the final ancient Greek element. Fire is not even a substance - it's a chemical reaction process. Water is a molecular compound, made of a very specific combination of two other elements. Air is a mixture of several different gases, each one variously made either of molecules or single atoms of various elements. And finally, earth is a mixture kind of like air, of different substances, each one made of different elements in a mad variety of different ways. Earth typically comprises a mixture of small pieces of eroded rock (crystals of particular combinations of elements) and small bits of organic matter, and its composition varies enormously depending on where your sample comes from. So we've deconstructed the elegant Ancient Greek system of four elements and replaced it with a hodgepodge of around a hundred disparate elements. But we've retained the idea that they combine to produce new substances, and we have an understanding of how they do that, and what it means for the many different possible chemical reactions we could produce. The Greek system ultimately failed alchemy because it was wrong. With the correct understanding of the elements, we can do much, much better than alchemy. Crystals are very interesting in their own right, but we don't have space to talk about them today. And I don't mean in the fuzzy New Age sense which attributes all sorts of strange energies and abilities to crystals. In reality, crystals are much more cool and interesting than that. How carbon manages to take on so many forms, with such widely varying properties, is another fascinating story in itself. You could write thousands of books just on the peculiar and chameleonic nature of carbon. In fact, people have. I've been lucky in my choice of example elements so far, which all have chemical symbols that are simply the first letter of the element name. This is not always the case. Tungsten's symbol is W (because historically it used to be called wolfram). And most elements have two-letter symbols: As for arsenic, Ga for gallium. And some of those came from Latin: Au for gold (aurum), Ag for silver (argentum). Hydrogen, by the way, gets its name because it is a gas than generates water, or hydro, from the Greek hydor, meaning water. If you burn hydrogen, rather than carbon for example, you produce not carbon dioxide, but water. Last Modified: Sunday, 30 March 2014; 00:15:57 PST.